Medium - £40.99 Only 3 left! Whoa. When we told you this Halloween is your time to shine, we didn’t think you’d take us so literally. We kind of meant that we are glad to see you feeling more confident and that Halloween could be a time for you to just kick back and have a ton of fun, you know? But...OK, cool. This works, too! We’re actually wondering if we shouldn’t get one ourselves--you seem really happy to be out on the prowl in this black jumpsuit. 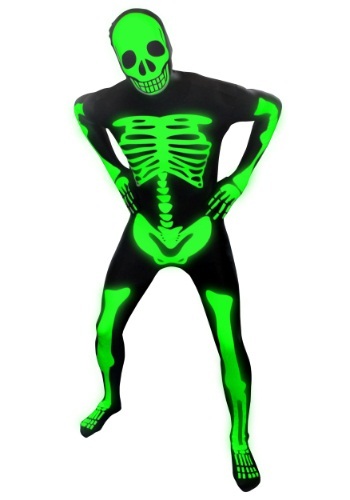 The green glow is really lighting up the night and every single person wants to watch the awesome glow-in-the-dark skeleton drink straight through his suit! We make no bones about it, this suit is simply illuminating all of the awesome things about you that needed to come into the limelight.